We are a British company at the forefront of designing and manufacturing specialist audio solutions to a multitude of markets from our factory in Worcester. We are a very passionate team of people who enjoy helping other people achieve their goals. We freely share good advice and expertise along with the hope that you will trust our advice and see the fantastic value in our products. All of our products and services are produced with care, skill and above all with our customers’ needs and satisfaction in mind. Coomber & Son was a family business founded in the early 1900's that offered equipment and advice to educational establishments. 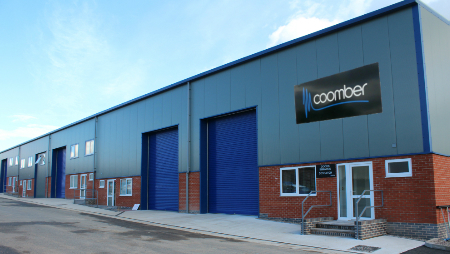 In 1962 Coomber Electronic Equipment was established and quickly became known as a leading British manufacturer and supplier of specialist audio equipment to the educational market. Supporting local businesses: At Coomber we have always sourced as many of our supplies and materials as possible from local, like-minded suppliers. We strongly believe in supporting Worcestershire businesses and in helping to sustain growth in the area. We work with many local schools, individuals and businesses on joint ventures from development right through to manufacture and supply. Protecting the environment: With the ever increasing need to be environmentally responsible, we have a commitment to reducing the carbon footprint of our business and we always source from local suppliers wherever possible and work with like minded organisations. The new factory recovers as much energy as practical from the processes and even the grounds are planted with natural British wild flowers and trees to attract and sustain wild life. A partner for local educators: By working closely with local schools we ensure that our products consistently meet the needs of the everchanging education system. We offer work experience placements and open up our factory for educational tours and to anyone who is interested in seeing a modern design and manufacturing process from beginning to end. Our conference rooms have provided an ideal meeting place for educational interest groups and local business alike. Local library project: A recent project involved developing a Listening Table for a local Library to use in their ‘Young Peoples’ area. Essentially a simple idea but the result has been a “dramatic reduction in behavioural problems within the library”. Presentation equipment for businesses: Other new products have included a range of Lecterns with built in PA to address the needs of many corporate businesses and conference facilities needing clear presentation equipment that is simple to use. Equipment for the Olympics: A rechargeable PA system with underwater speakers supplied at very short notice to help out the synchronised swimming teams with their Olympic preparation and training. At Coomber we are always looking to the future and have many new products in development for not only schools but for markets such as corporate, hotels, health & fitness, swimming pools, dance studios and libraries. So keep an eye on us! You are welcome to visit us and see first hand the wonderful handmade pieces of Radio and recording history.